As a dog mom of five, caring for my pack can quickly get expensive. From vet visits and supplements, to food and treats, clothing and collars, it adds up faster than I’d like it to. So, wherever possible, I try to reduce costs. One of the most recent ways I’ve started doing this is by making treats for my pups, myself! Besides the obvious cost savings, it also makes me feel better about what they’re eating. I know exactly what I mix up in a bowl, and I can give them all the goodness without any of the processed fillers that you find in store-bought treats. I started experimenting in the kitchen a little bit–not my favorite place to be if you ask my husband, as I rarely cook for him. But for my babies? I go all out! Admittedly, I’m not much for cooking, but baking is different. It is a little more fun, and I can still keep it simple! The fewer ingredients, the better. 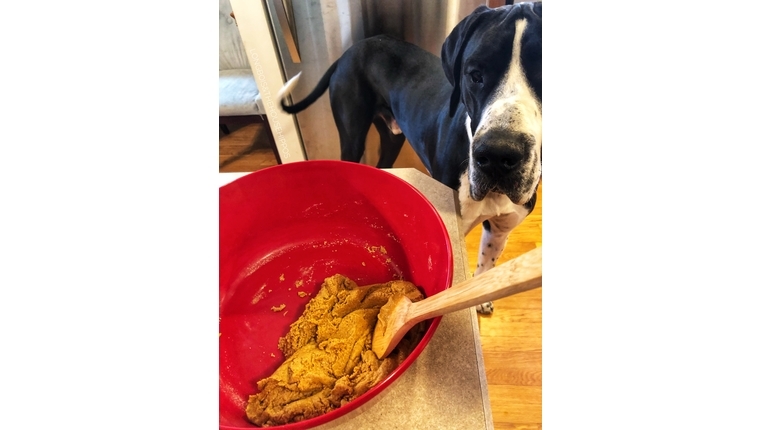 So, I came up with a super simple, grain-free dog treat recipe full of good nutrients that still tastes great–or so it seems from the puppy dog eyes and drooling while the cookies are cooling. 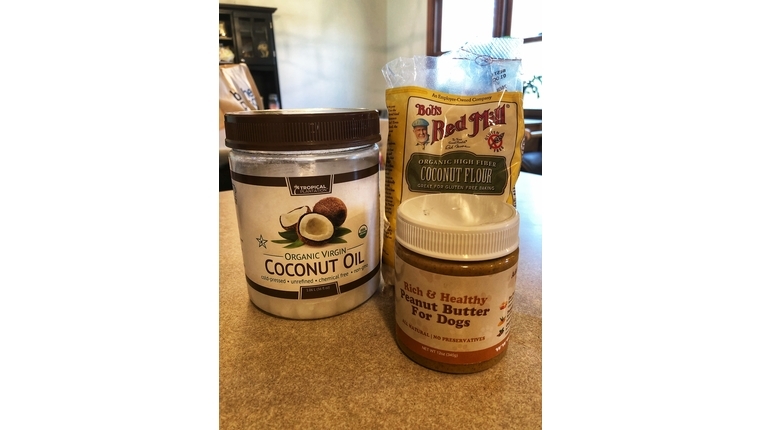 My favorite recipe I’ve come up with is Coconut Poochie Butter Dog Treats! When I think about how much I put into my dogs, physically with training, emotionally with love, and financially with vet care, it only makes sense to fill their bodies up with goodness, too! Most store-bought treats are full of sugar, sodium, and unsaturated fats–all things that shorten our furry friends’ life spans. The biggest culprit of these bad ingredients comes from my dogs’ favorite snack–peanut butter! In a quest to find a more dog-friendly and healthy alternative, I came across Poochie Butter Peanut Butter for dogs. Poochie Butter boasts zero added sugar and only two grams total, zero sodium, and zero preservatives. Check out some of the major differences above between “normal” peanut butter and Poochie Butter specifically designed for dogs above. Not only does Poochie Butter taste great, but there are all sorts of added benefits! It’s pup tested and husband approved–quite literally. He makes his own keto-friendly “fat bombs” with Poochie Butter! I’m very conscious about the supplements my pups take for continued good health, and all of the ingredients in Poochie Butter are helpful and not harmful. Coconut flour is a wonderful, minimally-processed alternative to bleached all-purpose white flour. The best part about it? It’s safe for ALL dogs, even diabetic dogs. Gluten-free and hypoallergenic: Coconut flour is wheat- and gluten-free. Gluten means “glue” in Latin, so not surprisingly, gluten acts glue-like in our digestive tracts. Dogs who are sensitive to gluten can have many uncomfortable symptoms including diarrhea, weight loss, hair loss, lethargy, and itchy skin. Coconut oil can not only be applied directly to the skin to soothe allergies, but also taken orally. Packed with proteins: Although dogs aren’t typically vegan or vegetarian, it’s a good alternative to meat protein. High in “good” fats: 90 percent of coconut oil fats are comprised of heart-healthy saturated fats that help with things like skin and coat health, immune system support, metabolic function that assists with weight loss, digestion improvement, and thyroid health. Boosts energy: Unrefined coconut oil increases energy and endurance. Aids in weight loss: Both coconut flour and oil are not only low in sugars and carbohydrates, but they also act as a fat and calorie burner. This helps balance insulin and promotes regular thyroid function. Coconut as a “superfood”: Coconut oil has powerful antibacterial, anti-fungal, and anti-viral agents, helping prevent infection and disease. It also aids in arthritis and ligament problems. Now that you know all about the health benefits of the ingredients in these treats, it’s time to actually make them! For some extra motivation, check out my pups enjoying them in the video above. They’re definitely pup-approved. Give this recipe a try, and your pups will thank you! Mix all ingredients together. Form into balls about ½ inch in diameter. Flatten on a baking sheet to aproximately ¼ inch thick. Bake aproximately 15 minutes, or until no longer soft. Enjoy watching your four legged kids chow down! When using coconut oil for dogs, always use unrefined virgin oil. And when introducing a new food to your dog, start small. If you want to give coconut oil to your dog orally to help dry or itchy skin–my pups enjoy this!–start with ¼ teaspoon per day for little dogs and puppies, and 1 teaspoon per day for larger dogs. Watch for changes in bowel movements or digestive activity! Also, keep in mind that this recipe is intended to be cost efficient, as well as healthy, so its a bulk batch. You can freeze unused dough or cookies for up to six months. 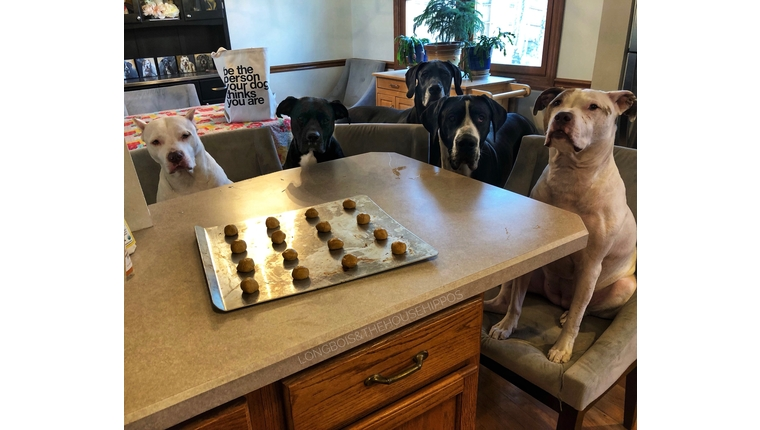 Katelyn Hoglund is a proud dog mom to five pups, and you can see what her fur family is up to on Facebook by following Dogs and Other Unsolicited Advice – L O N G bois and the House Hippos. You can also catch more of her dogs and her unsolicited advice at dogsandadvice.com and on YouTube at Dogs and Other Unsolicited Advice. Katelyn is a participant in the Amazon Services LLC Associates Program, an affiliate advertising program designed to provide a means for sites to earn advertising fees by advertising and linking to Amazon.com.